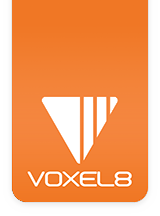 The following is the GCode cheatsheet you can use behind the scenes with the Voxel8 Control Interface (i.e. "OctoPrint"). G29 - Detailed Z probe, probes the bed at 3 or more points. Will fail if you haven't homed yet. or use S<seconds> to specify an inactivity timeout, after which the steppers will be disabled. S0 to disable the timeout. M111 - Set debug flags with S<mask>. See flag bits defined in Marlin.h. M209 S<1=true/0=false> - enable automatic retract detect if the slicer did not support G10/11: every normal extrude-only move will be classified as retract depending on the direction. M302 Allow cold extrudes, or set the minimum extrude S<temperature>. M501 - Read parameters from EEPROM (if you need reset them after you changed them temporarily). M502 - Revert to the default "factory settings". You still need to store them in EEPROM afterwards if you want to. M503 - Print the current settings (from memory not from EEPROM). Use S0 to leave off headings. M852 - Automatically adjust the Z probe's Z offset so that the current position is set to 0.